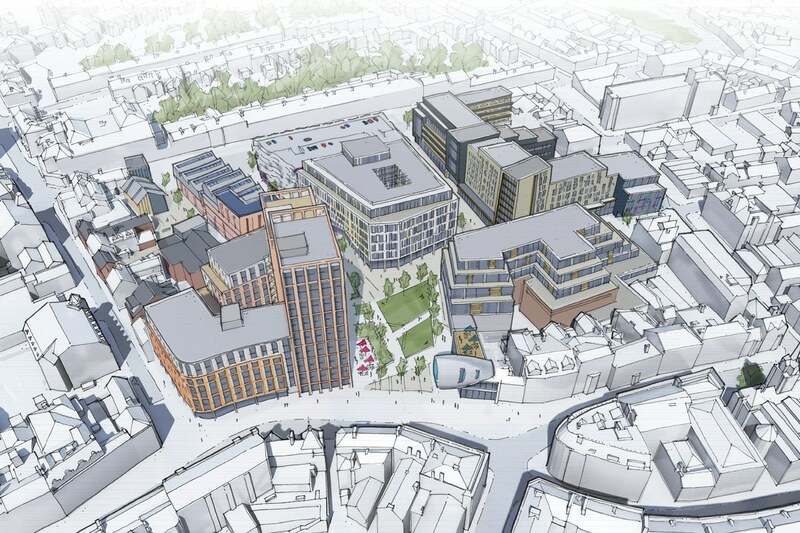 Plans for a major mixed-use development in Derby city centre are set to go on display this week. Local residents and businesses are being given the opportunity to view the current proposals for the Becketwell area of the city at a public consultation event in Derby’s intu centre. An outline planning application is set to be submitted in May with work on the demolition of the former Debenhams building due to take place later this year if approval is granted while construction would begin in the spring of 2020. The event is being staged by property developer St James Securities on the ground floor of the intu Centre from 10am 7pm on Thursday 28 March. The company is working with Derby City Council to on the regeneration of the Becketwell area which will include a mix of homes, workspace, hotel, retail and leisure uses, along with a new public square. A new residential development will be built, comprising of two buildings, the tallest of which will extend up to 17 storeys in height. This building will contain 220 apartments over a ground floor café and restaurant overlooking the new square. The smaller building will house 90 apartments over a retail store. In response to feedback, it has been designed to retain the curve of the existing buildings to the Victoria Street frontage. The new public square will be delivered as part of the first phase of development. When completed, the entire scheme plans provide more than 500 residential units, a new public square, up to 269,000 sq ft of business space, hotel, restaurants and cafes and a 500-capacity multi-storey carpark. Paul Morris, director of St James Securities, said: “Since the closure of the former Duckworth Square Shopping Centre in the late 1980s, a number of proposed developments have been promoted across the site. “These range from supermarkets to health-hubs, offices to an ice rink and an urban entertainment centre. “We are determined to realise a vision which is both aspirational and deliverable and would like to encourage local residents and businesses to come and see the proposals and have their say on this spectacular project.